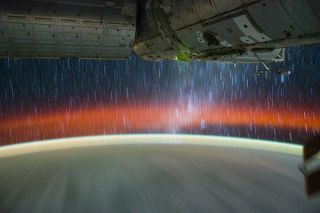 Caption: NASA astronaut Don Pettit captured the effect of star trails by taking multiple 30-second exposures and “stacking” them using a photo editing software. While many photographs from space highlight the view of Earth from above, a new video showcases the sight of the stars from a higher vantage point than usual: the International Space Station. Photographer and aspiring astronaut Alex Rivest compiled a time-lapse video of night sky imagery from the space station, showing the glowing sweep of stars rotating overhead, as well as the misty sight of the Milky Way and other celestial wonders. "Time-lapse sequences of the stars remind us, not only of our constant movement in space, but in the back-drop of un-imaginable depth," Rivest told SPACE.com in an email. "On a lucky night living in the city, you can maybe see 5 stars if you are lucky, so to be able to get away from light pollution and be reminded of how many stars there are is always a humbling experience." Most of the photographs featured in the video were taken by NASA astronaut Don Pettit, who is currently living and working aboard the orbiting laboratory as part of the long-duration Expedition 30 mission. "I got the idea to do the same thing from Space Station; however, the physics of orbit adds a special twist," Pettit wrote in a NASA blog posted Monday (March 26). "As Space Station orbits, it keeps one side always facing the Earth (the nadir direction from our point of view). This requires the Station to complete one revolution about its axis each orbit, just like the Moon." Many of the shots are illuminated by the green and purple glow of auroras, or northern and southern lights, created when charged particles from the sun slam into Earth's magnetic field. "Having seen some of the amazing compilations that had been put together of the Aurora and the Earth at night recently, I found myself drawn to the glimpses of the stars in each shot, and wanted to create a video for myself that was a compilation of the best star shots," Rivest said. He was also interested in getting a better idea of what it's like to see the universe from space, since he recently applied to NASA's 2013 Astronaut Candidate Class. "Part of the reason I made this video is because I wanted to imagine what it would be like to sit in the Cupola during a research break and watch the stars," Rivest said.